The Gazette has reported that residents in the Prince George's County town of Forest Heights have taken issue with newly installed speed cameras on state highway 210. Update 5/19/2011: Please read our Full Investigation into Forest Heights Speed Camera Errors, learn how these citations have been failing to hold up in court, and see the town and their contractor's desperate attempts to hide the truth from the public. 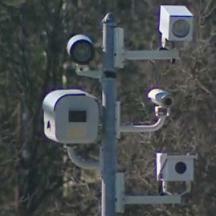 The cameras are located on Indian Head Highway/ Route 210 just south of the intersection with Livingston Road in Forest Heights. The speed limit drops from 40-mph to 35mph immediately before the cameras. Some residents claim that "the town ignored recommendations — although not mandates — by the Maryland State Highway Administration not to install the cameras on a hill or near traffic signals, highway ramps or speed-transition zones, as the two cameras are." The article states that the town created a 1/2 mile long new school zone on highway 210 (just as many other towns and cities have been doing), since the town is only authorized under state law to use the cameras in school zones. Residents noted that the highway is not close to crosswalks, has limited egress, no schools in the immediate area, and leads to a ramp for the Capital Beltway. There are two elementary schools in Forest Heights, but neither one is along highway 210. The town also spent $10,000 (of taxpayer money) on a 'feasibility study' that determined the highway 210 location was adequate "because of high traffic volume". Mayor Andrea McCutcheon claims that the speed cameras are justified in that location because "the majority of drivers are exceeding the speed limit", even though by definition that means the speed limit is NOT set at the 85th percentile speed which is the recommended speed limit by many standard traffic engineering practices. The town is projected to earn about $500,000 from ticket revenues (after expenses, defined however the town wishes to define 'expenses'), about 10% of the town's budget. Speed camera money can only be spent on "public safety" (a term which is not defined by state law and based on what other towns have done could mean anything from crossing guards to cable TV lines to a new office for the police chief). Speed camera funds can also replace existing "public safety" spending -- rendering the financial restrictions completely unenforceable. "The cameras were originally placed near a back street in the town during the 30-day grace period that began March 1 before being moved along the highway, leaving some to wonder why the town decided to use the grace period on a less traveled road." the article states. The warning period has been handled similarly elsewhere, in New Carrollton, for example, only about 150 "warnings" were issued during the 30 day grace period whereas about 13,000 real tickets were issued in the next 30 days.